The Kona Coffee Living History Farm (on the former Uchida Coffee Farm) is a 5.5-acre historic coffee farm, first homesteaded in 1900, and is the only living history coffee farm in the nation. The Uchida Coffee Farm is an intact example of the lifestyle of early Kona Coffee farmers, many of whom were Japanese and brought Japanese customs and culture to Hawai‘i. Don Francisco de Paula y Marin recorded in his journal, dated January 21, 1813, that he had planted coffee seedlings on the island of Oʻahu. The British warship H.M.S. Blonde brought coffee trees, to Hawaii, from Brazil in 1825. Coffee was planted in Mānoa Valley on O‘ahu, and from a small field, trees were introduced to other areas of O‘ahu and neighbor islands. Reverend Samuel Ruggles moved trees to Captain Cook, Kona in 1828. Hanalei Valley on the North Shore of Kaua‘i was home to the first coffee plantation. Between 1868 and 1924, more than 140,000 Japanese came to Hawai‘i with 3-year labor contracts to work for the sugar plantations and, when their contract expired, many decided that a different lifestyle suited them better. The 1890s boom in coffee-growing in North Kona was encouraged by rising prices. Although sugarcane plantations expanded with US annexation in 1898, coffee-growing grew in Kona because of its adaptability to land that was too rocky for sugarcane. During the early coffee boom, Portuguese and then Japanese laborers had filtered into Kona. As one coffee plantation after another gave up when coffee prices fell and sugar plantations became more attractive, these plantations were broken up into small parcels (3 to 5-acres) and leased to these laborers. Many worked on the newly formed sugar plantations and worked their coffee orchards as side lines. As the coffee prices remained low, the Portuguese abandoned the coffee orchards, and by 1910, the Japanese were about the only growers left to tend the coffee trees. By the 1930s there were more than 1,000 farms and, as late as the 1950s, there were 6,000-acres of coffee in Kona. At the turn of the last century there was coffee on all the major Hawaii islands, and now 100 years later, there is once again coffee on all the major islands. The Uchida Coffee Farm illustrates the development of small-scale coffee farming facilities along the Kona coffee belt of the Big Island, now considered a world class coffee. It serves as an intact example of the structures that typify the coffee farm lifestyle and technology used in the 1900-1950s by Japanese coffee farmers in Kona. The house is an excellent example of architecture adapted to the climate and needs of a particular family; it demonstrates some of the influences Japanese culture and tradition has had on Hawai‘i’s architecture. The “Living History Farm” brings the coffee pioneer’s story to life by depicting the daily lives of early Japanese immigrants during the period of 1920-1945. Electricity was installed just before the war in the early-1940s and hot running water wasn’t established until the late-1960s, when the modern bathroom was added. There was never a shower or bath tub, the furo was used. Although the family did use a gas stove in the last years at the farm, the stone fireplaces, used up until recently for rice and wok cooking, are still in place. The Farm museum, operated by the Kona Historical Society, is open for tours and 100% Kona coffee sales Monday – Thursday, 10:00 am – 2:00 pm. There is a small fee for the tour. Please call for special group arrangements: (808) 323-2006 or email at coffeefarm@konahistorical.org. Living history gives visitors an opportunity to experience history “brought to life” by costumed interpreters who demonstrate traditional crafts, agricultural activities and the everyday tasks of people from the past. Visitors may walk through the coffee and macadamia nut orchards, tour the historic farmhouse, talk story with the interpreters and visit with the donkey and chickens. 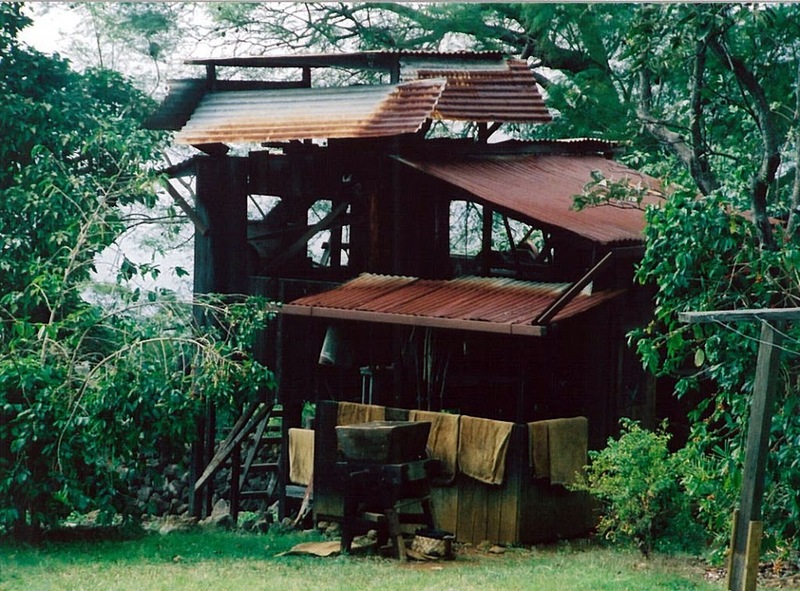 The image shows the mill on the Uchida Farm; in addition, I have included other images on Kona Coffee in a folder of like name in the Photos section on my Facebook page.